One of the most frustrating sentiments in the musical community is some people’s strange aversion to learning music theory. People find every excuse to justify it, but the two most common arguments I hear are: 1) their favorite artist didn’t know theory so they don’t need to either, and 2) knowing theory is going to make them less creative or box them in somehow. If maybe you’ve thought either of those before, or maybe you just haven’t thought about theory at all, I’m hoping to convince you that learning music theory is hugely beneficial to any musician. I’m not saying you need to learn classical counterpoint to enjoy playing in your AC/DC cover band, just that a deeper analysis of what you’re playing will reward you in the long run. Learning an instrument is a lot like speaking a language. Guitarists that “speak” guitar can have entire conversations that may sound like complete nonsense to non-guitarists, and it’s the same case with drummers, keyboardists, vocalists, etc. Each instrument lends itself to a certain vernacular; a certain school of musical thought which shapes how ideas are expressed on that instrument. The obvious issue is that sometimes it becomes hard for musicians that play different instruments to effectively communicate with each other. This is something I’ve witnessed many times in band scenarios as people try to suss out a wrong note in a chord, or a sour note in a melody. Guitarists will show keys players their finger placement, or tell them what fret numbers they’re playing, but the keys players will have no idea how a fret number correlates to the piano, and question why the guitarist can’t just play the dang B minor. Then everyone realizes that communication has broken down, and just resort to plunking it out by ear - which is slower, and much more prone to error. So, how could all these different musicians transcend their instruments and effectively communicate? Well, music theory of course - music theory is the lingua franca that connects all instruments. It turns chord shapes on guitar into a universal idea that’s easy to talk about, easy to move onto keys, easy to voice into a horn section, and just much easier to think about in general. It lets drummers effectively communicate rhythms to their band, instead of relying on their own idiosyncratic language of hand tapping and beatboxing. It lets bass players pick arpeggios and passing tones without all of the guesswork. It lets vocalists lay out harmonies precisely against the rest of the music. Everyone benefits. The most important function of music theory is to give you the right words and frameworks to use when discussing music, so if you run into dead ends when working with other instrumentalists, that’s a clear sign to study up on the theory behind your own instrument. As we learn to talk about our own playing, a serendipitous side effect is that we can use those same skills to…. A student that learns the rote mechanics of playing guitar, then switches to learning piano, essentially starts at square one. If you simply learn the shapes and names of guitar chords without studying the underlying notes and patterns of the notes, you’re just re-memorizing new patterns on the keyboard. Understanding the underlying patterns of music on one instrument catapults you ahead in your learning of another instrument, as it allows our brains to reuse and repurpose musical ideas divorced from the mechanics of the instrument. Someone that understands music theory can quickly add new instruments to their repertoire just by working through the new mechanics of the instrument, more easily adapting the concepts from their previous instrument. Moving from one instrument to another is not only fun, but can be an excellent way to invoke new musical thought. As you listen to music, it becomes obvious that there are certain very popular musical ideas that we hear adapted over and over again. For example, progressions like the 12-bar blues, or a 1 6 4 5, are ingrained into our musical history, but sometimes just hard to see without the right training. Consider a song with a progression that goes C to F to G, and a different song that goes D to G to A. At first look, these songs may seem to have little in common, but with some knowledge of chord analysis, suddenly these become the exact same musical idea - both are 1, 4, 5 progressions. Seeing patterns like this can show us similarities between music that may not have seemed related before. When writing original music, being able to see patterns and ideas that other composers have used in this more abstract, theoretical way allows us to apply the information in new and creative ways. We can borrow interesting chord movements from songs we enjoy, and combine and rearrange them to create new ideas. All it takes is just looking at ideas one step removed from the actual music. Often, a student will come to me very excited to show me their genius new musical invention - maybe a new scale that they’ve come up with, or a new chord shape. I then have the sad job of telling them that, actually, that scale is already an established modal scale popular since the 1950’s, or a well-known harmonic minor going back to the classical era. I typically see two types of responses when I give them the bad news. One type of student will feel robbed of the “newness” of their idea, believing that any idea they come up with has probably been thought of before so, why even try to imagine new things. The second type will be excited - if this idea has already been thought of, what did the people who thought of that think of next? Where did they end up on their musical journey? Feeling that spark of innovation can foster a strong sense of kinship with someone that has experienced the same spark - a reminder that humankind has been on a continuous quest of musical exploration basically since we began being humans. So where are we collectively in that quest? The study of music theory will give us ways to think about and discuss all that has been explored before. And when we start running out of established discussions, that’s where the real avant garde begins. I strongly encourage anyone looking to improve as a musician to spend some time studying music theory. 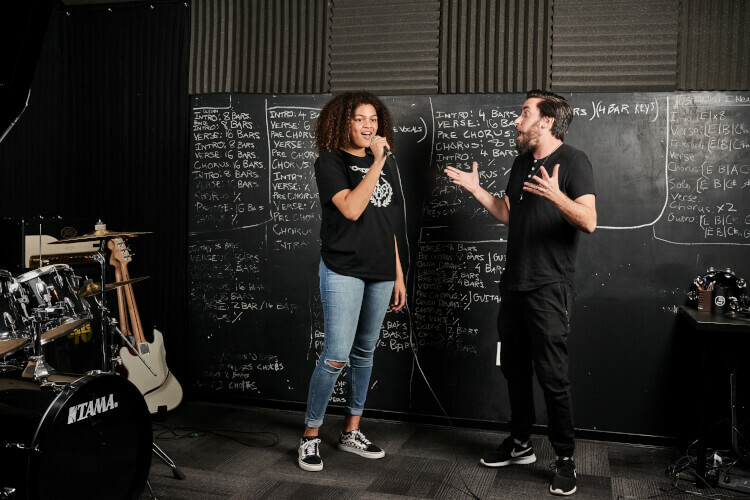 It may feel tedious and restrictive at first, but learning to become fluent in the language of music is a skill that will pay off over and over in your musical process. As always, feel free to reach out with questions or comments - I am always up for talking theory!